BANGI, 10 October 2014 – A biography of the late Prof Ishak Shari (1948-2001), one of The National University of Malaysia’s (UKM) renowned scholars and economists who was acclaimed for his research into poverty and marginalization in society, was launched here today. The biography Ishak Shari, Defender of All Mankind is published by the Institute of Malaysian and International Studies (IKMAS) and was inaugurated here today by the Chairman of the National Professors’ Council (MPN) Prof Emeritus Tan Sri Dr Zakri Abdul Hamid, who is also Science Advisor to the Prime Minister. It was witnessed by his widow Rashidah Mohd Dali and his eldest son Adi Suuria. Prof Ishak was a former director of IKMAS. Also present were UKM Vice Chancellor Prof Datuk Dr Noor Azlan Ghazali, the author of the biography Dr Muhammad Salleh Lamry, IKMAS Director Prof Dr Rashila Ramli and Prof Emeritus Dato’ Dr Abdul Rahman Embong, Principal Fellow at IKMAS who gave an introduction to the book. National Literary Laureate Prof Emeritus Dr Muhammad Haji Salleh also a recited a poem titled Scholar and Healer in memory of Prof Ishak. Coming from a humble family background and growing up during the era of Merdeka and its aftermath and the formation of Malaysia, he entered the world of scholarship with a deep and life-long commitment to a vision of a shared and just future. Shaped by the intellectual and political ferment of the late 1960s and early 1970s, he became one of the active student leaders who helped define the moral and intellectual horizon of Malaysian student politics in England during that period. That early moral and intellectual integrity and social commitment never left him throughout the course of a long and illustrious career. 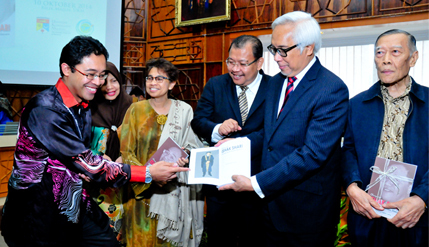 The focus of his PhD dissertation was on poverty in the traditional fishing sector, which was a reflection of his understanding of Malaysian social science in the service of a developing nation. Throughout his life, this commitment to the poor and the marginalised was to inspire his teaching, research and writing. Aware of the changing global landscape, he consistently drew attention to issues of inequity and was also concerned, in his later works, with the onslaught of global neo-liberalism and unfettered economic liberalisation. Speaking at the launching ceremony Tan Sri Zakri described the book as reflecting the thinking and ideology as well as Prof Ishak’s personal views on injustice, poverty and inequality that occurred in society. “It also makes for fascinating reading, about his family background, history of education services and thoughts of Prof Ishak as a prominent scholar,” Zakri said. Prof Abdul Rahman said Prof Ishak was a remarkable man whose leadership qualities should inspire all, particularly young people. “As noted in the biography, Ishak was a scholar, thinker and intellectual who had made major contributions in the field of education and development while working inside and outside the University. “The biography also showed Ishak as someone who was always cheerful and laughing. He was a very open-minded, loyal friend, an exemplary husband and understanding father,” Prof Abdul Rahman said. Adi Surya, in turn, expressed surprise when he reviewed the draft biography and discovered that although his father was serious in his career as a researcher, he was a prankster and joked with colleagues. However, when his father was at death’s door, his last words were: I am living on borrowed time. I know that I am leaving. Thank you for everything and I might not be around after this. The book Ishak Shari, Defender of All Mankind contains 31 chapters and is divided into seven sections, in addition to featuring 58 photographs.